First thing’s first. The word Arabber is an old world name given to the group of people who make their living selling fruit and vegetables from horse and cart. There used to hundreds of stables working from back alley stables throughout Baltimore. Today, there’s only one working stable and one in a holding pattern literally in tents under a bridge in West Baltimore. In July I published a feature in the magazine, The Urbanite. It was the result of a year’s worth of work, some of which I filed with the Baltimore City Paper. You can check out the articles on http://www.citypaper.com and do a search or go to http://www.urbanitebaltimore.com and check out the 20 minutes in video, four stories I did. There’s a rush you get or at least I get when a story gets published. I still get it and is probably why I’m still in this miserable profession despite having a wife and two kids and doing a terrible job as a provider. (More on that later). Anyway, after you put out a story there’s this nagging question what now? I established all this contact and got all this momentum, do I just drop it and go on. Sometimes, most of the times yes. But with the Arabbers, a sub-culture I have been writing about for ten years I don’t want to let it go. I’ve got a line on a story that goes beyond the quaint but sad narrative of people of old timers trying to make a living from horse and cart. 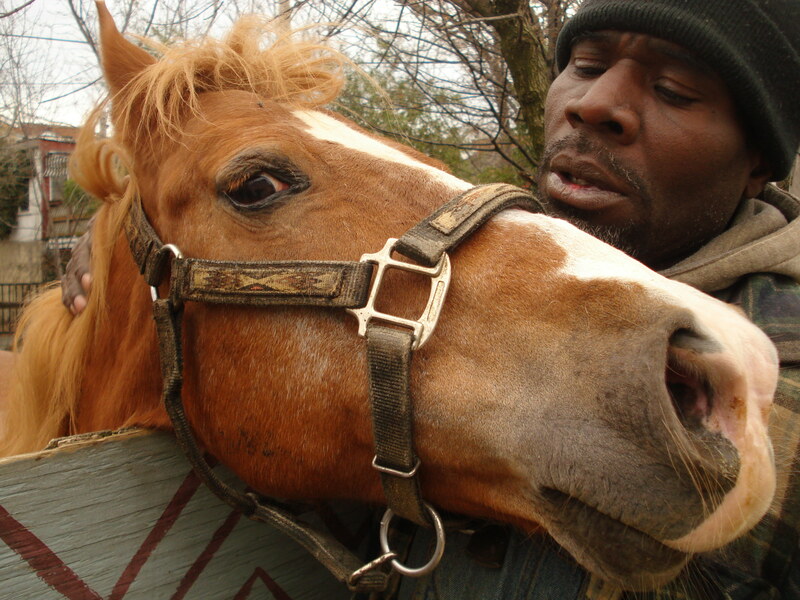 I want to go into their lives and work my way backwards, that is I want to write about their lives on the margins in Baltimore, dealing with poverty and their aspirations and then go oh by the way, he’s walking to his job which happens to be taking a horse out on the streets. I believe I have this story with Dante, a nine-year old kid, who aspires to be an arabber. Today I went down there for the first time since the article came out. The reception was frosty and strange, but that’s what happens. The stable manager gave me grief for mentioning that I someone was smoking pot in the alley. Not an arabber mind you, but a resident who lived in one of Baltimore iconic alley homes, tiny homes built for B & O Railway workers back in the 19th Century. I told him wasn’t trying to besmirch the stables but rather show how the kid’s love of horses kept him away from the teenager offering him to join the party. The kid kept his attention on a horse rounding the corral that was build right there in the alley. It’s a wild sight watching these horse lapping around in the dirt knowing you’re right in the city. There’s a sense of serenity. I went back there today and Dante had already gone out with a new arabber, a good sign that the culture isn’t quite dead and I hung out with Keith “Superstar” Brooks, his father Brock and “China” sharing some food. Nothing else but the re-affirmation that the story is rich and waiting for me to push on.